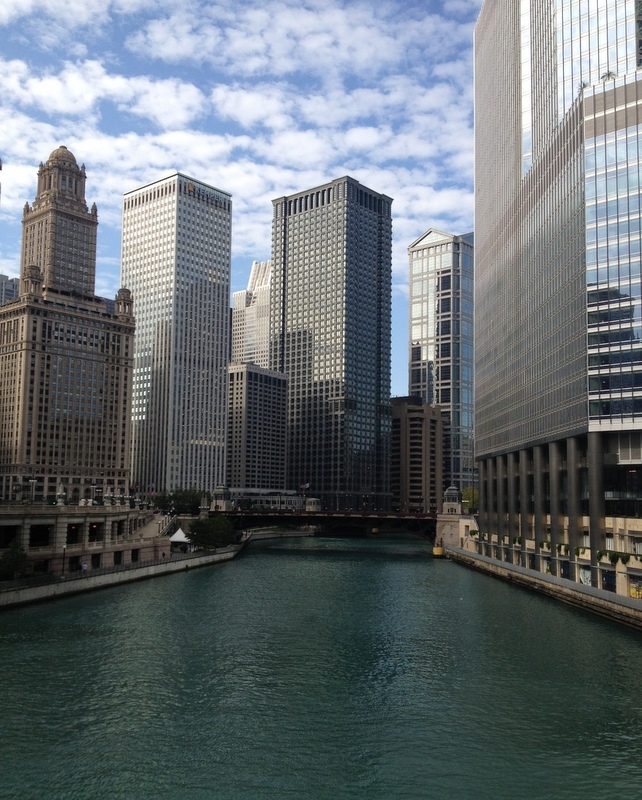 This weekend I am in Chicago. Warm, sunny and 75 degrees just amazing fall weather. Travel and keeping low carb can be a bit of a trial, but I am getting the hang of it. I found a great breakfast spot called the Corner Bakery, sounds crazy for a low carb breakfast but if you can ignore all the muffins, coffee cake and bagels they make wonderful scrambled eggs and bacon. The Anaheim Scrambler with crisp applewood smoked bacon, tomatoes, green onions, and cheddar cheese, topped with avocado was a favorite. Just ask them to hold the potatoes and toast. Ignore the funny looks and declarations that you will still need to pay for them, and you get a nice filling breakfast. FYI-the cash register automatically deducted the cost of potatoes and toast! 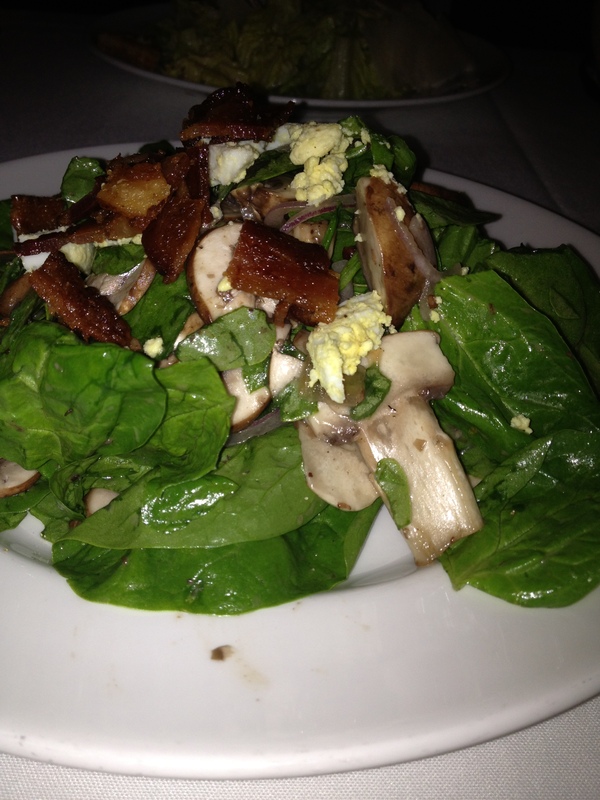 I had a wonderful spinach salad at The Capital Grille, perfect for a late night dinner. Definitely something I plan to recreate when I get home. Tender baby spinach leaves, onions and mushrooms with chopped egg and smoked bacon on top. The warm bacon dressing was wonderful. I am little worried there was some sugar in that dressing. 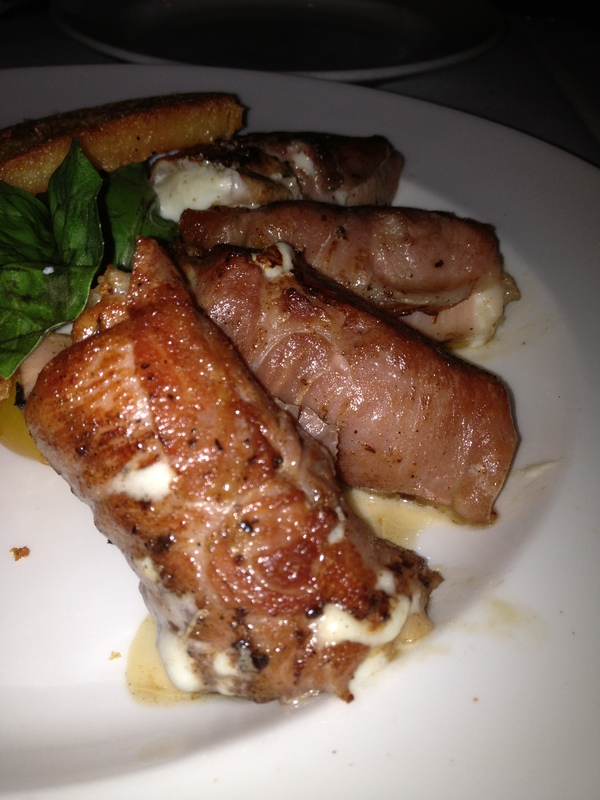 To start our meal at The Capital Grille we shared an appetizer that was perfection. For anyone wondering about the benefits of low carb living, check this out. No carbs, eat this with reckless abandon! It is fresh mozzarella wrapped in prosciutto and lightly sautéed. The fresh basil and drizzle of balsamic glaze* the perfect addition. It came with crostini which we ignored. Easy to do. I need to try this at home. Great appetizer for dinner parties. *This is just reduced balsamic vinegar. Simmer balsamic vinegar over gentle heat until reach desired thickness. Balsamic adds sweetness, so watch the are carbs. Read the label on your balsamic vinegar. Usually about 5 grams per ounce, use sparingly. A very light drizzle is all that is needed. Finally I want to share a great lunch find. 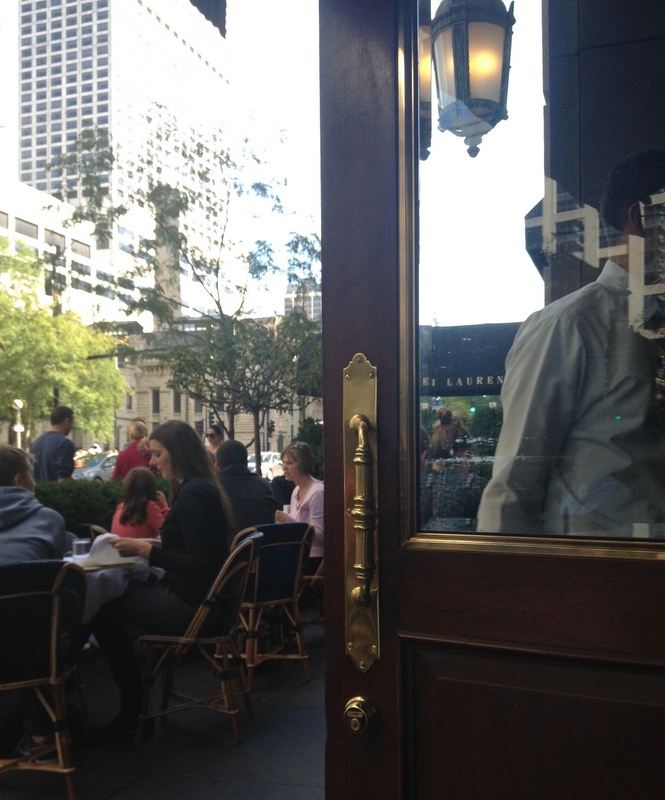 On Saturday afternoon, we sat outside at The Ralph Lauren Restaurant just off Michigan Avenue. 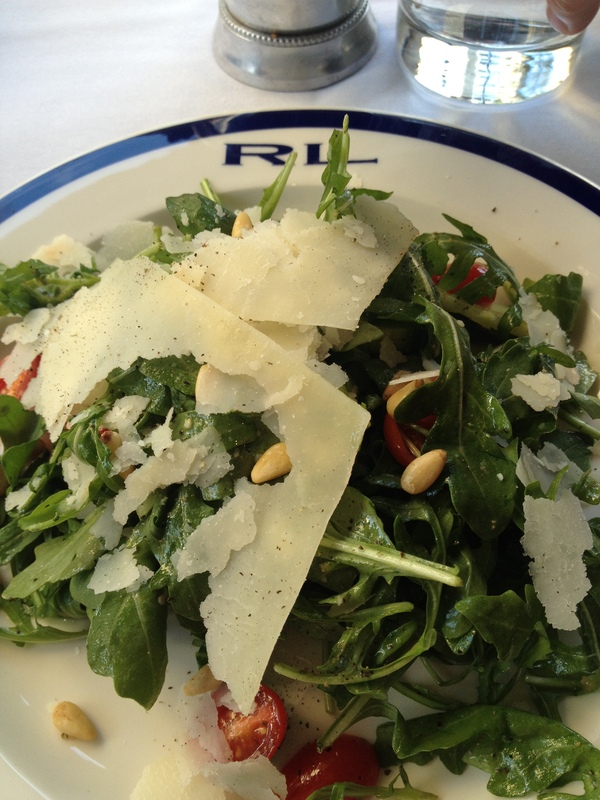 I had the the Baby Arugula Salad with Tomatoes, Cucumber, Parmesan, Pine Nuts tossed with a Champagne Vinaigrette. It was so reminiscent of our recent trip to Italy! It seemed a steal at under $10. Just sitting there on a beautiful afternoon people watching was worth more than that! A new non-profit has recently been created called the Nutrition Science Initiative(NuSI). 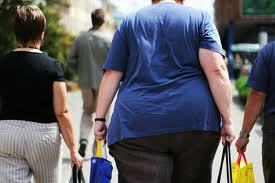 This group hopes to challenge the basic presumptions about obesity with scientific studies. NuSI says large-scale scientific studies that tackle fundamental questions — like how food really affects fat, hormones and the brain — are what’s needed to solve it more than anything else. Check out this link for more information on this “Manhattan Project” on nutrition. Gary Taubes and Dr. Peter Attia founded this San Diego-based organization. 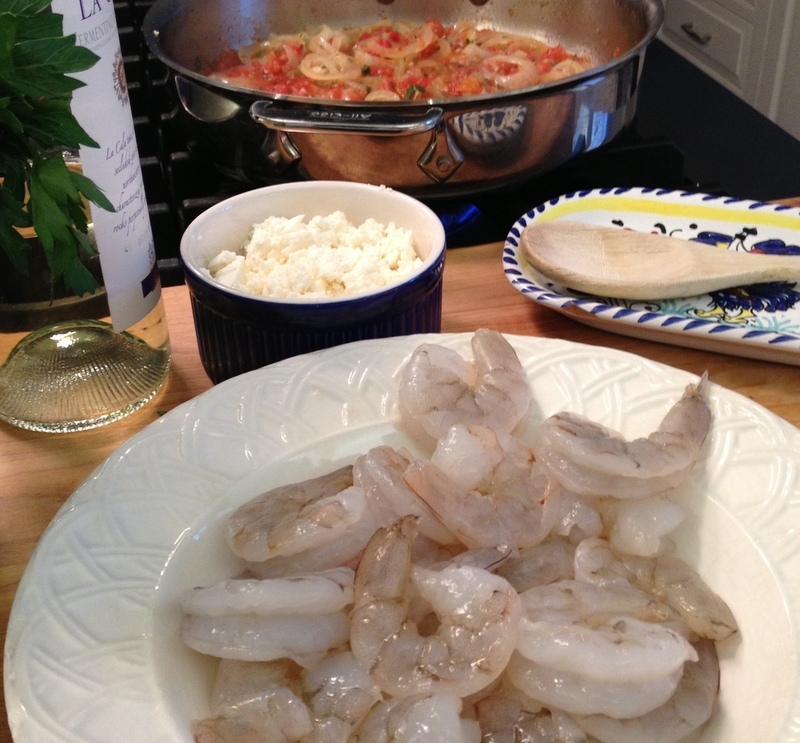 Having a bag of uncooked large shrimp, peeled and deveined in the freezer is a life saver. Thaws in no time under cold running water or if you remember in the morning to thaw in refrigerator even better. Something to keep in mind in the low carb world is cooking with onions. They can be very sweet and high carb if you choose Vidalias or other varieties of sweet onions. Stick with yellow or white onions. Another option-use scallions which are very low carb or 2 T chopped shallots only 3 carbs. In oven proof large skillet or casserole, heat oil and saute garlic and onion over medium heat until onions transparent. Being careful not to let garlic brown. Add wine, tomatoes, herbs and seasonings; simmer 30 minutes or until thickened over medium/low heat. Keep it simmering not boiling. Add shrimp and stir to coat. 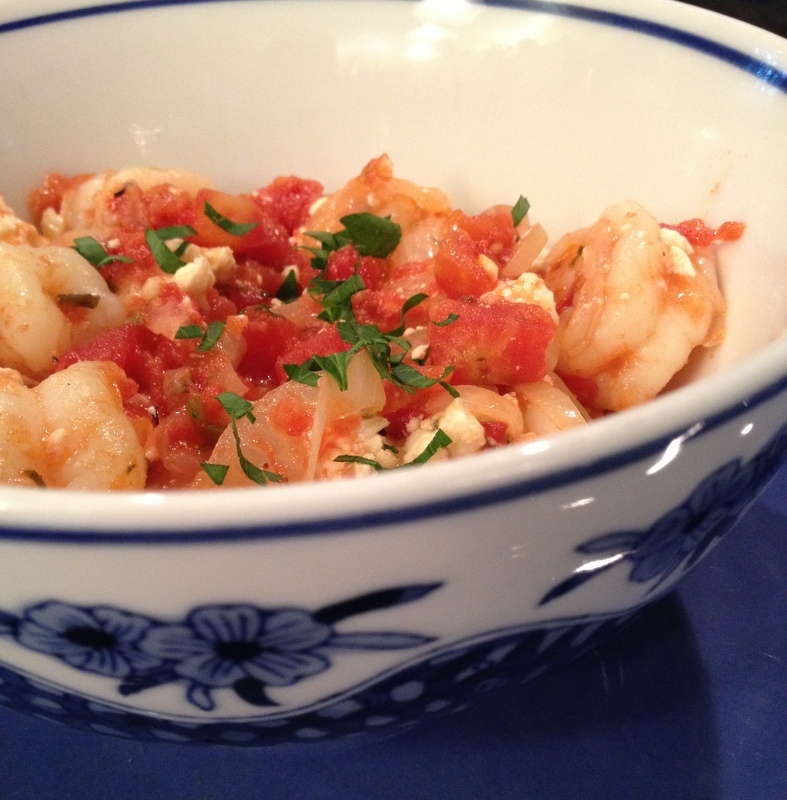 Remove from heat and crumble feta over the top. Bake in preheated 425 degree oven for 15 minutes, until cheese browns and casserole is heated through. Say it ain’t so! 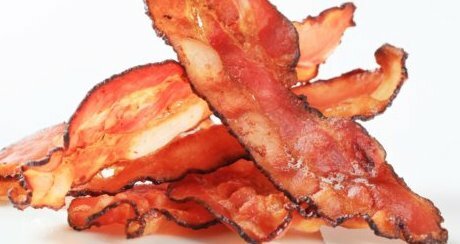 One of the perks of low carb eating is having bacon with no guilt. Rumor has it there will be a pork shortage in the coming months. All due to drought conditions that have led to smaller herds of pigs in Europe and the United States. The low carb life is great because green vegetables take a very prominent place in meals every day. I have never eaten so many! 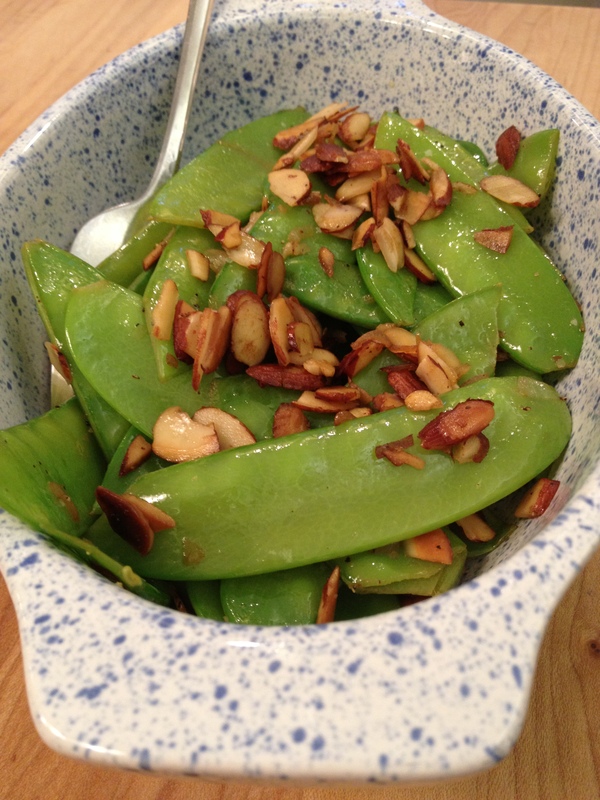 This is one of my favorites because the peas are so crunchy and fresh tasting. This recipe is my adaptation of recipe from Bon Appetite-April 2009. Melt 1/2 T butter in medium skillet over medium heat and cook almonds until starting to turn golden and butter starts to brown. Stir constantly for one minute. Take off heat. Being careful not to overcook. Remove almonds to a plate. In the same skillet melt butter over medium heat, add snow peas and shallots and saute until peas are crisp tender, about 2-3 minutes. Add almonds and stir. Remove from heat, add lemon juice. Season to taste with salt and pepper. The taste of Chinese Five Spice Powder is hard to describe. It is a blend of cinnamon, cloves, star anise, fennel, and Szechuan peppercorns. Used most often in Asian cooking, this aromatic blend is a combination of spicy and sweet. 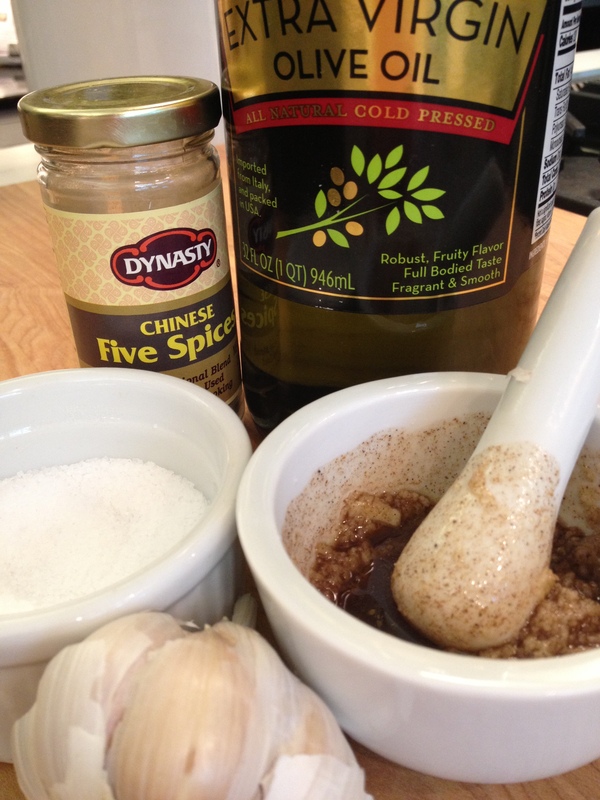 I make a rub using Five Spice Powder to use when roasting pieces of chicken. It is so flavorful and there is a wonderful aroma when roasting. The recipe below is my version of a similar recipe I found in Bon Appetite a few years ago. Crush the garlic and kosher salt, using a mortar and pestle, to make a paste. (If you don’t have a mortar and pestle, finely chop garlic or use garlic press and put garlic into a small bowl with the salt and mix together with a spoon.) Once the garlic and salt paste is formed, combine with the olive oil and Five Spice Powder. This is the rub. In medium bowl coat the chicken pieces with the rub, then cover and refrigerate for an hour minimum. May be left overnight in the refrigerator to allow flavor to fully develop. In small roasting pan drizzle a little olive oil and arrange onion wedges and set the chicken on top of onions. Roast for 45 minutes at 425 degrees. Remove from oven and rest for 10 minutes. 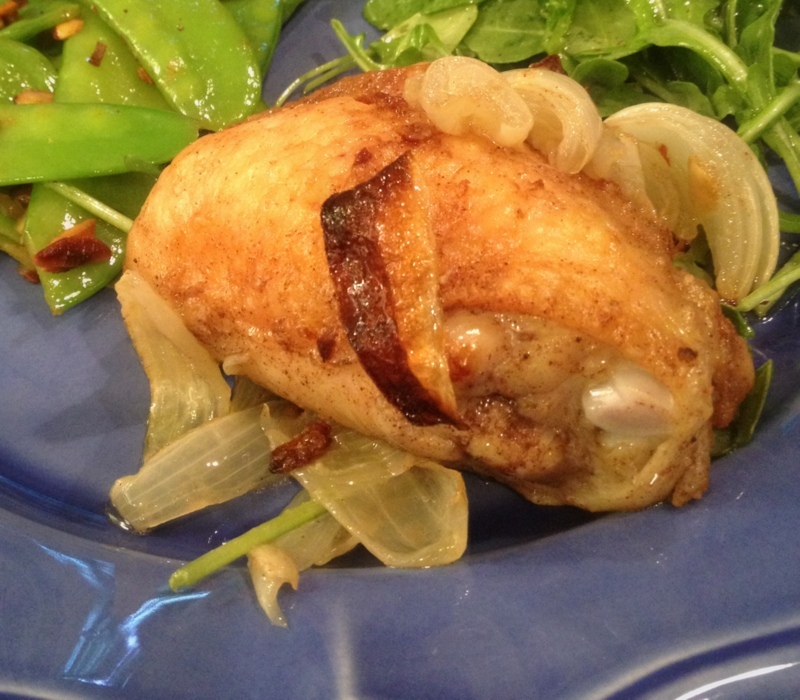 I served this with Snow Peas & Toasted Almonds and Arugula dressed with vinaigrette. Grilled lamb chops are perfection in my book, but don’t forget ground lamb as a convenient less expensive option. They smell so good cooking. 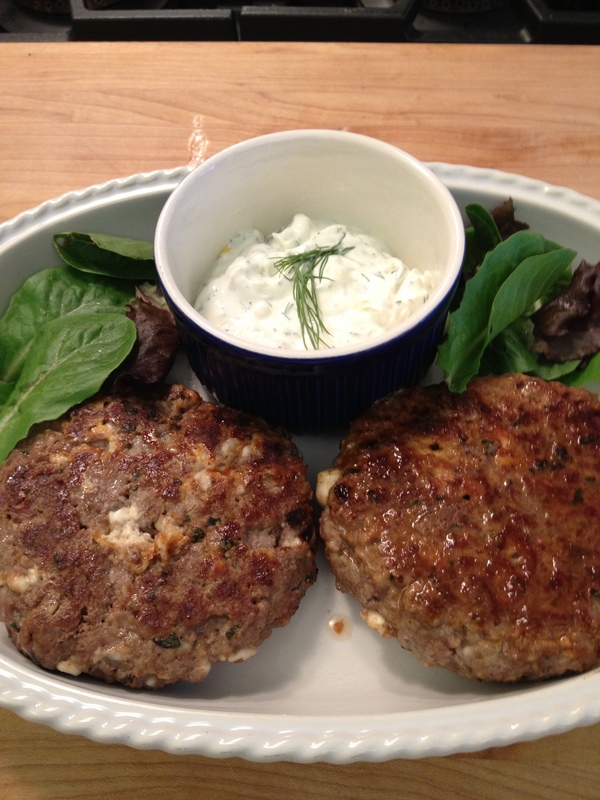 Easy to cook outside on the grill or inside in a skillet or griddle. I use a meat thermometer to test for doneness. In bowl mix all of the ingredients with a large fork. Be gentle mixing everything. The water keeps the burgers moist and helps hold ingredients together. 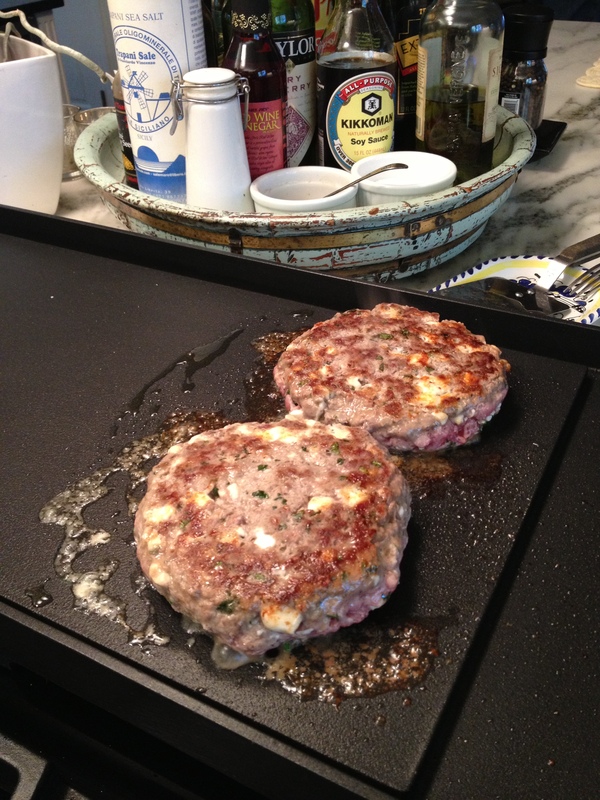 Shape into two equal size burgers, about 1″ thick. Heat grill over medium high heat and sear burgers to form a nice dark crust. Cook about 12 minutes until internal temp reaches 165, then let burgers rest, off the heat for 10 minutes before serving. 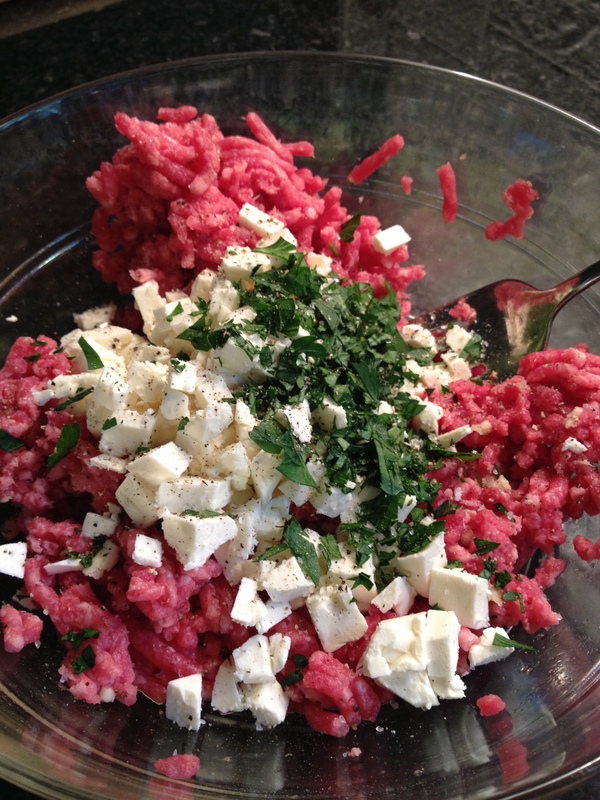 In a medium bowl, stir ingredients together, season with kosher salt and fresh ground pepper. Chill if not using immediately.